LOS ANGELES, CA and LAKE BUENA VISTA, FL--(Marketwired - Aug 8, 2016) - Blaze Fast-Fire'd Pizza, the nation's leading fast casual artisanal pizza chain, announced today that it has opened its new flagship restaurant in Disney Springs at Walt Disney World Resort. The modern day "pizza joint," known for its chef-driven recipes and casually hip restaurants, debuts in an architecturally innovative structure that was designed specifically for this iconic location. Blaze's menu centers around its artisanal "build-your-own" pizzas, to which guests can add any toppings, all for one great price. In addition, the restaurant features fresh-made salads, a variety of lemonades and aguas frescas, real cane sugar sodas, and a large selection of craft beer and wine. Driven by its commitment to "Intelligent Choices for Our Pizzas, People & Planet," all dough is made in-house, pizza and salad ingredients are free from artificial colors, flavors and preservatives, and the restaurant uses only eco-friendly packaging. At 5,000 square feet, the new restaurant is much larger than a typical Blaze Pizza and will feature two "blazing" open hearth ovens and two guest service lines. The restaurant has seating for 200 and will accept the Disney Dining Plan. "Our mission at Blaze is really simple -- we're taking pizza back to its roots," said Jim Mizes, president & COO of Blaze Pizza. "By making dough in-house, carefully sourcing ingredients, and cooking by fire, we're giving guests a great way to enjoy artisanal pizza in mere minutes." "We are excited to be part of the new Disney Springs expansion where we get the chance to introduce our custom-built artisanal pizzas to guests from around the world," said Rick Wetzel, co-founder of Blaze Pizza. "True to Disney's high standards, we have built an amazing flagship restaurant that will include interesting architectural elements, great service and fantastic meals." Located in the heart of Town Center, the newest neighborhood in Disney Springs, the new Blaze Pizza restaurant honors the Disney tradition of storytelling by tying into the Disney Springs' turn-of-the century Florida theme, with a building modeled after an 1850s-era sawmill that has undergone a contemporary design renovation. The structure showcases the evolution of wood construction -- from early, traditional timber framing to modern-day feats of high-strength wood engineering. To highlight the change, the restaurant uses single species wood in the open kitchen and ordering area, including lumber milled from a Cypress log felled over 200 years ago and reclaimed from Florida's Apalachicola River. Materials then transition to multi-species wood in the indoor dining room, with tables and benches arranged to mimic logs entering the structure from the adjacent Spring. The design marks a final evolution on the outdoor patio, which features furniture made from eco-friendly, reclaimed wood and sawdust composite. 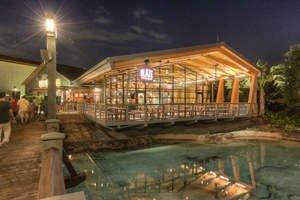 The capstone of the restaurant is a large, covered patio that cantilevers over the waterfront, where guests can dine. Award-winning Los Angeles designer Ana Henton worked with Morris Architects to bring the project to life. Blaze Pizza is a modern day "pizza joint" known for its artisanal pizzas, freshly made salads, blood orange lemonade and s'more pies. Each restaurant features an interactive assembly-line format that allows guests to customize one of the menu's signature pizzas or create their own, choosing from a wide selection of fresh, artisanal ingredients -- all for one low price. The generously-sized 11-inch pizzas are then sent to a blazing hot open-flame oven -- the centerpiece of the restaurant -- where dedicated pizzasmiths ensure that the thin-crust pies are fast-fire'd and ready to eat in just 180 seconds. Each restaurant makes its own dough from scratch using a recipe developed by critically-acclaimed Executive Chef Bradford Kent (also known as the "Pizza Whisperer"), which requires a 24-hour fermentation period to produce his signature light-as-air, crisp crust. For pizza fans with specific dietary needs, Blaze Pizza offers gluten-free dough and vegan cheese. The first Blaze Pizza restaurant opened on Aug. 6, 2012, in Irvine, California, and quickly gained attention for its chef-driven recipes and "build-your-own pizza" assembly-line format. Now ranked as the leading fast-casual pizza chain in the Technomic Top 500 Chain Restaurant Report, Blaze Pizza is building momentum and developing a cult following as it expands across the country. The company currently operates 150 restaurants in 31 states and Canada, including the major metropolitan areas of Los Angeles, New York, Chicago, San Francisco, Dallas and Washington D.C. Founded by Elise and Rick Wetzel (co-founder of Wetzel's Pretzels), the concept is backed by investors including LeBron James, Maria Shriver, Boston Red Sox co-owner Tom Werner and movie producer John Davis. Disney Springs is a one-of-a-kind Disney experience, treating guests by day and night to great dining, shopping and entertainment amid beautiful open-air promenades, flowing springs and waterfront charm. Offering an air of sophisticated grace and design that harkens to Florida's waterfront towns at the turn-of-the-century, Disney Springs is home to four distinct, outdoor neighborhoods: The Landing, Town Center, Marketplace and West Side. Nearing completion in 2016, Disney Springs has been undergoing the largest expansion in its history to double the number of shops, restaurants and other venues for guests to explore, which will result in more than 150 establishments. Disney Springs is part of Walt Disney World Resort, the number one family vacation destination in the world, located in Lake Buena Vista.